Bodybuilding is good for women of all categories. It is very important for pregnant women to keep fit since their bodies require high levels of stability in maintaining normal metabolism. If you have been weight training prior to becoming pregnant, then you may continue your weight training activities during pregnancy as long as they are not activities that could result in a loss of balance and you lower your intensity to prevent an increased body temperature and heart rate. Again, the goal during this period is maintenance and not improvement. Therefore, don’ t push yourself. Increase your rest periods in between sets to two minutes- so as to maintain a normal body temperature and a low pulse (below 140 beats). According to the Organization of Teratology Information Services (OTIS), a body temperature of 101 degree F and above can raise concerns during pregnancy. 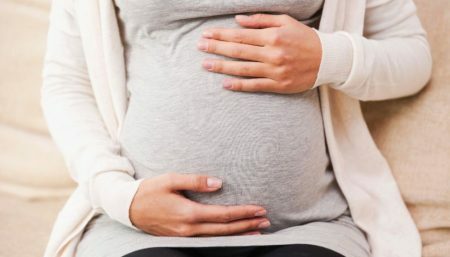 Some studies have shown an increased risk of birth defects in babies of women who had an increased body temperature during the first trimester of pregnancy. The American College of Obstetricians and Gynecologists (ACOG) recommends that pregnant women never let their core body temperature rise above 102.2 degree F. Monitoring the heart rate during exercises becomes is more important for a pregnant person. Because of your extra weight, the woman can reach her target heart rate even quicker. It is recommended that you check the heart rate after every minute and make sure that you do not exceed 140 beats in minute since it is dangerous and unhealthy. Perform only 2 exercises per body part of 3 sets each. This is a time when you do not want to un-necessarily strain your body and at the same time get a great workout. This also helps prevent injury to your muscles. Rest and stretch: With the added strain on your pregnant body from hormones, postural changes, and just general fatigue, you will definitely want to utilize a rest period of twenty-four hours between each workout session. Allowing your muscles to rest in between will give you a better workout with less risk of injury during your next session. You should also stretch between each group of exercises. Choose a lighter weight : In order to stay away from reaching muscular failure (point at which it becomes impossible to perform another repetition in good form) choose a weight that you can perform for 12-15 repetitions and perform 8-10 repetitions per set instead. Lifting too much weight at once, or using improper form, is the fastest way to injure yourself during pregnancy or at any time. When you do get injured during your workout, it takes your body longer to heal because your body would rather devote its time and attention to growing a strong, healthy baby. This leaves you hurting and unable to exercise. Avoid exercises involving laying down flat on your back (such as flat dumbbell bench press) since this position can decrease blood flow to the uterus and therefore the baby. Eliminate exercises that may cause a loss of balance such as lunges and squats. Instead, substitute them for exercises like seated leg curls and leg extension. As a matter of fact, if you have access to machines, this is the perfect time to use them. Prefer using exercise machines (during third trimester ) as compared to free weights as they make the exercises safer and would eliminate the possibility of losing balance. Also, by using machines, secondary stabilizer muscles, such as abdominal and pelvic muscles, are not activated. This is a good thing as we don’ t want to create any undue stress in these areas at this time. Another reason why machines are more desirable at this time is to prevent joint injuries. During pregnancy, a loosening of the joints occurs. This loosening allows ligaments and tendons to stretch in preparation for delivery. Because of this, there is a higher risk of incurring a soft tissue injury if free weights are used. If you choose to continue using free weights during this period, then remember to pay close attention to your exercise form and to choose your exercises carefully. Eliminate the Abdominal exercise portion of your workout as we must avoid any exercise that may risk even mild abdominal trauma. In addition, avoid exercises where you have to lay down flat in your stomach. For instance, substitute lying leg curls, by either standing or seated leg curls. Don’ t hold your breath while exercising since by doing so, you can cut the oxygen supply to your baby. Always exhale on exertion. That’s easy to remember because you will E (exhale) on E (exertion). Inhale as you lower the weights or return to a neutral pose. Weight training is not something to take lightly. You should seriously consider getting some professional, or at least experienced, help while exercising with weights. This is to help you prevent injury to you or your pregnancy, and to give you a good idea of what your body can handle. 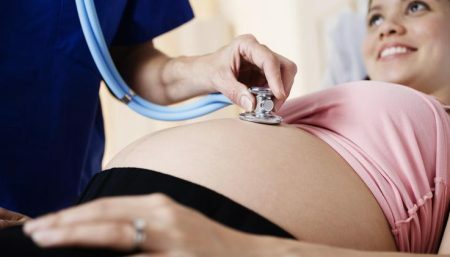 Other symptoms like, maternal or fetal Distress must be checked thoroughly and one should stop exercising in case she notices such conditions. Let bodybuilding be a fun moment for pregnant women and not something to add more stress. It would be rather safe to not train if you are not sure of how to go about it, rather than risk the lives of both you and the fetus.